In the run up to Christmas we’ll be taking part in a beautiful pop up on Columbia Road. Kana London, Charm Vintage Jewels, Pico Goods, Oli, Hazel Castle, Londe Botanics, Yellow Gorse, Wilder Botanics, Grace Alexander Flowers, Celestial Objects, Molesworth & Bode, Rachel Cocker, West Dorset Soaps, Wanderlust Paper Co, Molina Del Ray, Studio Rua, White Doe, Me & My Bloomers, Abi Barras and Sleepy Doe. We’re delighted to be part of a new Richardson Studio project. Founded in 2017 by Rebecca Carr and John Hollington, Effects is a modern market for designers by designers, and aims to showcase established and emerging talent from across the UK, and from a range of industries. Stoff Studios are please to announce that they have been nominated by Jocelyn Warner to present their new work at this year’s 100% Design, 100% Forward at London’s Olympia. 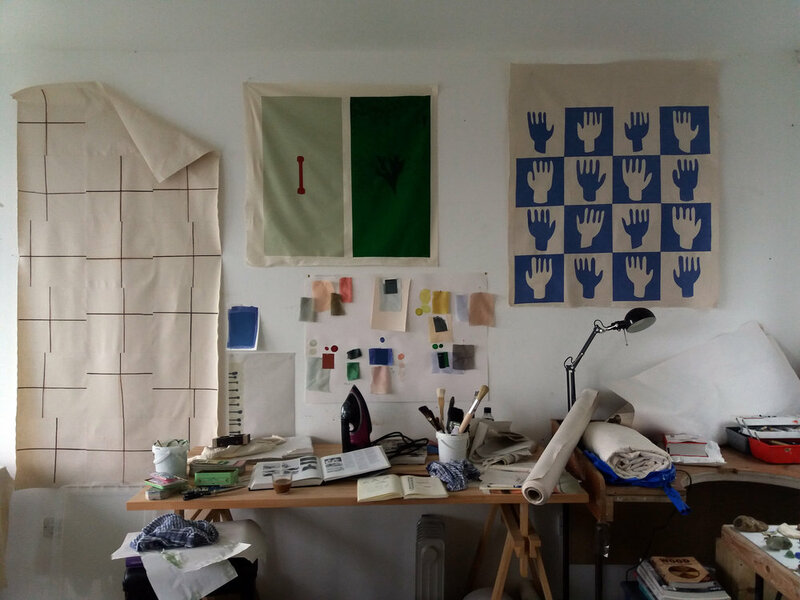 Makers House Make & Collaborate was curated by Georgia Bosson as part of the 2018 edition of South East Makers Club for the London Design Festival. The exhibition was designed to celebrate collaborations between designers as well as the collaborative effort that it takes to put together a Makers House exhibition! During July we spent a month at Cove Park, on the Rosneath Peninsula in Argyll and Bute. Cove Park’s UK Craft Residency supports an established designer/ maker at a key stage in their career. It enabled us to undertake research, explore new ideas and make significant developments in our practice within the context of Cove Park’s international and cross-disciplinary programme. We had an wonderful time making work, drawing, swimming and eating great food with some amazing people! This year Custhom and Stoff Studios will be showing new collections as part of their independent show ‘Paper round”, housed in the beautiful Exhibit Gallery during Clerkenwell Design Week 2018 which is perfectly placed between Clerkenwell Green and the Barbican Centre. With a shared appreciation of the paper model, the two studios wanted to explore their common interests and begin a conversation. From colour blocking to exploring materials through making process, there will be a showcase of how the two studio’s think and make, from working drawings and models to their latest products. For the third Christmas running, we are very excited to announce that The Garage Sale is back! 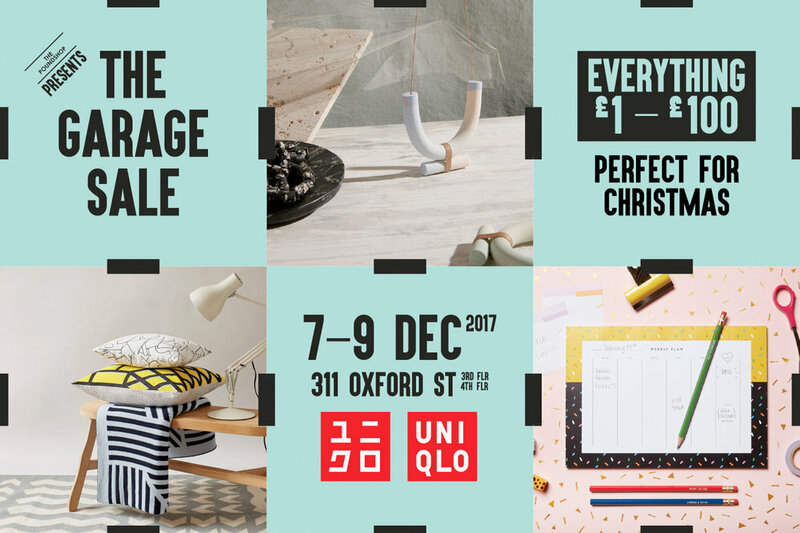 This time, we are hosted by UNIQLO and The Garage Sale will be located on their LifeWear Floors, in the heart of Oxford street, London. 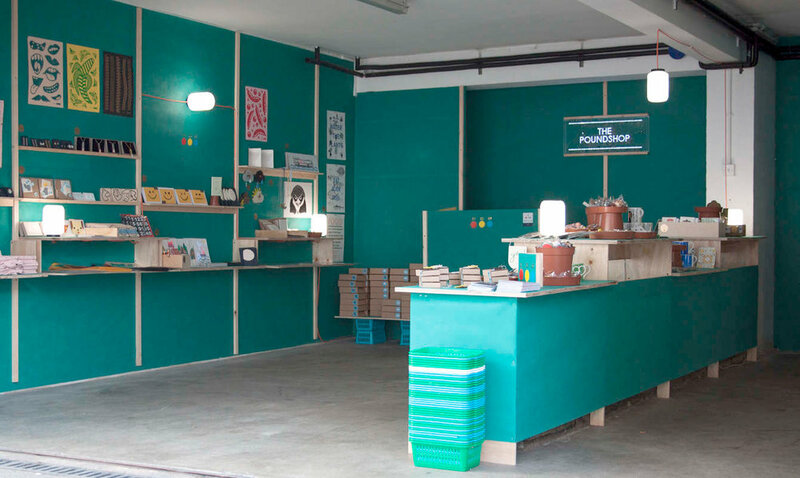 The Poundshop no.18 opened at Brompton Design District for London Design Week 2017. For this occasion they also introduced their latest project The Poundshop Cart. Showcasing products made by over 30 UK designers, all within the affordable price bands £1, £3 and £5. Interior was built and designed by Jeffery Lambert and Yann Perusset. During London Design Week, Stoff Studios will be showing as part of the British Craft Pavilion at the Truman Brewery’s Design Fair. Curated by Hole and Corner. An evening programme exploring interiority as a collective experience and the affective potential of the surface. A live event that builds on the format of a film screening to create an arrangement situated between the theatre and the exhibition through an interlacing of films, objects, movement, singing and speaking. Reflecting back on the work of Betty Woodman, this evening aims to think through feminised expectations and the possibility of an event as a decorative object. This conglomeration of disparate voices seeks to bring into focus modes of address and subject matter such as the decorative, the sentimental, the silly, the private, the irrational, the trivial or the talkative and unfold the ways in which vulnerability, intimacy and unguarded emotion can act as biopolitical gestures that recuperate their historically diminished cultural value. A transgenerational dialogue creating possibilities for relating at a distance.